My aunt wanted to introduce this place to me. As soon as she mentioned a Russian restaurant I knew where she was talking about. Taipei as far as I know only has two russian restaurants. Salt & Bread which seems to have some negative reviews accusing it of being too compromised by the Taiwanese preference. Fortunately that's not the one my aunt was talking about. It was Astoria near the Taipei Main station. It has an awesome history dating back to the 50's. Here's Wikipedia's excerpt on it's history. Yeah, this place even has it's own wiki page! "In October 1949, 18 year old Archiybold Chien became business partners with six Russian immigrants who fled Shanghai to Taiwan. Together they opened Taipei's first western style pastry shop on Wuchang Street in downtown Taipei. They offered pasteries on the first floor and a cafe on the second floor. One month after the Astoria opened for business, Chiang Kai-shek resumed presidency of the Republic of China and relocated his government to Taiwan. After the Korean War broke out in 1950, the United States maintained a significant troop presence on Taiwan. During this time, the Astoria hosted many important guests from abroad, including Jane Fonda. The cafe was also a frequently visited by Chiang Ching-Kuo, who had studied in Moscow for many years and his Belarussian wife Chiang Fang-liang. In 1950, Astoria hosted a Russian New Year Celebration which was attended by Chiang Ching-Kuo and his family. Chiang Kai-shek's last birthday cake was also prepared by chef's from the Astoria. After World War II, the Cafe Astoria became a popular spot for many socialites and government officials. It was also a spot where many struggling writers and intellectuals met and composed their works." Their specialty is the borscht. It's a beetroot soup with a deep red color to it. I was expecting something a little more hearty. But since I have no previous experience, I'll just say it was awesome. It'll be my benchmark until another russian (or eastern european) tells me otherwise. ha! However that was what my aunt had. I chose a pig knuckle plate. Fall off the bone pork with a crispy fried skin! The meal comes with some brown bread (also soft and very delicious) and a bowl of mushroom soup (i think) and a cup of Ronnefeldt tea. Expect your bill to be around $500+ a person. But they also have some afternoon tea for a cheaper price. The decor was very much matched with the eastern european or russian theme. The windows let a lot of light in and I saw several people there reading books and just relaxing over some tea and cookies. The restaurant doesn't mind. 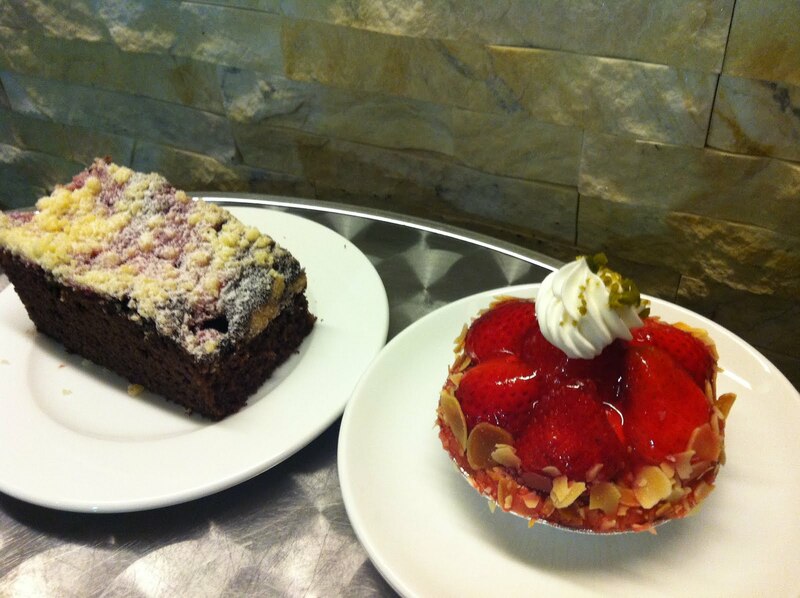 Or if your in the mood for something quick or sweet, head downstairs to street level and visit the confectionary. One of it's specialities include a soft Russian marshmallow candy called Mazurka walnut cakes. It was once only available to the Russian royal family, but can now be bought on the go. I highly recommend going to this cafe and confectionary as it's one of the rare, if not only Russian restaurant in Taipei. Let along a long illustrious six decade history that dates back to CKS. Yuki and I attended a free cooking class near SYS memorial. It took about 2 hours and they fed us some of the food that was cooked. Cheese and black sesame mochi balls and Taiwanese sticky rice. But we were still a bit hungry, so we headed around the corner to Wendel's German bakery and bistro. I forget if I've mentioned this place before, but it's a great little western bakery. Sounds german, but I'm not knowledgable enough in German breads to judge. The interior looks very comforting. It really has a clean luxurious european bakery look to it. Perhaps normal in other parts of the world, but in Taipei it's pretty swanky. They have large glass display cases of breads, chocolates, brittles, danishes, cakes and cookies. But don't forget the pretzel tower on the counter. MMmmmm. I totally miss a hot giant pretzel sprinkled with those large salt kernels. Kind of like the ones you get at the county fair. Alas it was for another day. I eyed the chocolate raspberry crumble cake before the pretzel. Too many deliciousness to try for one evening. 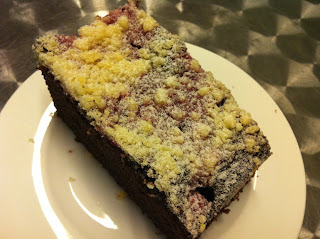 I settled down in the cozy patio out front with my chocolate raspberry crumble and hot cocoa. Prices are around $350 for a cake and drink. From what I hear, a cake and drink is the minimum order for dine-in. I will be back possible for a nice afternoon tea or just desserts. I took the liberty of listed all their locations in chinese for easier google maps look up, but please visit their website for more information and awesome photos at http://www.wendels-bakery.com. No. 28, Lane 260, GuangFu S. Rd. Lazy Sunday pancakes. I woke this morning not wanting to do anything except feed my hungry stomach. And it was asking for only one thing, pancakes! After some research on places in Taipei that offered pancakes, I gave up. It was either too far or too expensive. So I called up brother from another mother aka Kiwi, which happens the live in the neighborhood. I remembered last time he had some left over Costco pancake mix and golden syrup. So my girlfriend and I strolled on over to the Yonghe traditional markets for some fruits and toppings. After fighting our way through some thick crowds, we ended up with some strawberries and bananas. Thinking back I saw a vender that sold nuts. Some crushed pecans or walnuts would have added some stellar crunch texture. Next time. So we zipped on over right in time as Kiwi was just starting to fry up the first batch. We tried some plain and some with banana slices mixed in. Some chopped fruits and golden syrup, viola! Enjoy! They serve the most killer pizza at Chicago Pizza Factory. Walking in, the decor really gave off a down home feel. It felt like I walked into someone's spare room filled with memorabilia clutter. After closer inspection, it all Chicago memorabilia. This really hits home for me. Looking around at some of the toys, signage, pictures, Cubs and Bears items, an old midway airport status board (i think)...really brings back the memories. However this only leaves room for about 4 tables. Once the owner discovered I was from the states, he opened up and started to speak in fluent English. He also spoke to my girlfriend in Japanese too, so he's at least trilingual. I learned Chicago Pizza Factory is actually a Japanese pizza brand, not a local restaurant started by a long time Chicago resident that moved to Taiwan as I would have assumed. Taiwan originally had 14 locations, if my memory serves me right. But the owner found it way too hard and stressful to manage 14 branches. He would teach the chef's how to properly make the dough and pizza, but after a month, they would cut corners and the quality would suffer. So he closed all but one location. Now he can get off of work at a reasonable hour and see his family and also personally manage the pizza quality. This means a lot. We ordered two pizzas because there was a special going on. Looking through the menu, they had some localized versions with very odd ingredients and some traditional versions with american toppings as well. He recommended that I order it with extra thick crust and extra sauce option. That way it'll be closer to what I was used to in the states. The sauce really makes or breaks the flavor of a pie, so extra is a must. I don't understand how Taiwanese can call their bland sauceless pizzas, pizzas. I dreamed of a stuffed crust or a properly Chicago-style thick crust, but in the end the crust was about normal. Thick for a Taiwanese that's used to cracker crusts, but not thick enough for a die hard Chicago pizza fan. But don't get me wrong, it's still an exceptional crust. Crunchy, buttery and golden delicious! The owner said he only uses the freshest and most natural ingredients, so the crust will stay moist even eaten as leftovers. It won't get hard and dense like cheap crusts. But why not a super thick true Chicago-style thick crust? Because he used to do that on special order, but it would take up to an hour to cook. He discovered many customers were too impatient and complained of the wait time. So he trimmed the thickness and cook time down. They do make deliveries, but dine-in or pick-up will net you a better deal. Pies run about $300-400 for a 9" and $480-580 for a 14". Despite the dreary, rainy and grey day it was, my Aunt was intent on showing me the Danshui Fisherman's Wharf (淡水漁人碼頭). So far I've only been to the Danshui old streets and haven't ventured out to the Fisherman's Wharf. Probably due to laziness as usual. So I have to thank her for dragging me over. I appreciate it. You can get there via MRT+Bus. After taking the MRT all the way to the most northern station of Danshui (now called Tamsui), we exited and waited around for my Aunt's friend to show up. During our wait I discovered a small food stall selling Taiyaki. I go all crazy over Taiyaki. Not only are they small fish shaped cakes but it's filled with delicious custard or red bean. I've found them filled with other fillings before, but this place only offers the two. It reminds me of my favorite Taiyaki shop back in California called Sweet Breams. I miss the weekly off-the-wall flavor specials. The Danshui station shop does have a particularly unique fish mold. The fish come out even smaller, in these perfect bite-sized and slightly pudgy fishies. Cute enough I almost couldn't eat them...almost. It costs $100 for a school of 10. Afterwards we headed on the bus to the Fisherman's Wharf. Bus R23, R26, 836 all take you there. Upon arrival we went straight to the dim sum restaurant on the first floor of a large luxury hotel that when viewed upon from afar, looks like a cruise ship. Unfortunately we arrived a bit too late in the afternoon and they were closing up. It's one of my aunt's favorite dim sum places in Taipei. So moving on, we walked down to the boardwalk scenery area along the shore. The boardwalk which sits right above all the restaurants offer some great views. The boardwalk will take you to the end of the pier and to the famous Lover's bridge. In addition, the restaurants/cafes below offer the same great view but under shelter on a inhospitable weathered day like today. Most of them have a panoramic window on the back wall facing the water. During the evenings, they have live bands and much more of a festive atmosphere for young couples. NOt so much of that activity during a dreary weekday afternoon though. My Aunt recommend coming on a weekend day before sunset between 4-5pm, so you can watch the sunset and the lights of Bali (neighboring seaside town) light up across Tamsui river. I've been craving and searching for a good american BBQ restaurant for a while. Maybe I wasn't searching that hard, as I didn't have high hopes for something like that. But fortunately through my cross-fit trainer, he introduced me to a BBQ joint opened by a foreigner in the jhongshan district 中山區. It's called Ed's Diner. Looking at their Facebook page, I see they ordered and imported a rather large oven. And judging by the stacks of wood, it's a wood burning oven. So I was salivating with anticipation of a properly slow cooked wood smoked BBQ pork/beef/chicken. I had to pick up my girlfriend from the Songshan airport today, right about the time for lunch. Coincidental timing. So we took a quick MRT ride over to Jianan Rd. MRT station (the same one next to Miramar mall). The walk over to the restaurant which didn't take long, about 10 minutes. When we arrived, it was empty because it was a bit early for lunch (a little past 11). But I wanted me some BBQ! The interior has a very simple American design of wood and brick. They only have about 12 tables, but I think I remember a few outside too. Walking through the saloon doors in the back, is the bathroom. The bathroom has a hawaiian theme to it. Odd. I don't see how that ties into the BBQ, unless they served some Kalua or Lau Lau, which they don't. But that's ok, perhaps Ed has a love for Hawaii too. On a tangent, this bring sup another good quest...Is there a good Hawaiian BBQ restaurant in Taipei? Now back to the BBQ, I ordered a pulled pork hamburger plate and my significant other, some BBQ chicken. The pulled pork turned out pretty delicious. Tender and juicy with that good porky flavor. The sauce was tangy but not too strong that it overpowered the flavor of the pulled pork. I was a tad disappointed with the smoke flavor though. It didn't have much. Perhaps it's because he's using 龍眼木 (roughly translated Dragon's Eye wood). I'm not familiar with that wood, but from my knowledge, cedar/hickory/mesquite would be the wood of choice. However I guess that type of wood may be hard to come by. In addition, it was raining that day. Perhaps the moisture got to the wood and the smoke wasn't able to penetrate to the meat properly. Furthermore, I felt the hamburger was a tad on the small side. My girl's BBQ chicken on the other hand was much better. Our meals came with a soup, salad (or fries) and baked beans (other sides available). The baked beans were good in my opinion. Soft, sweet and smokey in flavor. However my cross-fit trainer brings up a good point. Ed's Diner used black eyed peas instead of haricot beans. It's been so long since I had quality BBQ I totally overlooked that. Either way, it was still tasty and had a great smoky and sweet molasses flavor. I WANT to visit this place again. Perhaps with some of my foreign friends that miss good ol' down south BBQ. I was eyeing the brisket sandwich on the menu, so I'll be having you next time! Prices range from $150 to $350, with a wallet smashing $750 NT 14oz Angus beef prime rib steak. Browse their menu on their Facebook page. Tonight is a revisit night. A revisit back to my favorite local deli for the freshest cut of meat between two soft slices in Tianmu (天母). Yes, It's Willie's Deli, formerly called 6&6 deli. I love this place. The interior reminds me of those old southwest general purpose stores you find scattered all over the Sierra Nevada valley. Back before super convenience stores and Costcos. The time of horse drawn carriages and cowboy hats. HaHa, I'm not that old. But thats just what it reminds me of. If you missed my old entry about this place, then let me do a brief reintroduction. Tianmu is Taipei's foreigner central hub. All the Americans, Europeans and Japanese tend to congregate here and live here. Therefore little shops like Willie's Deli is in huge demand. Willie's Deli is primarily a importer of rare American/European goods as well as a meats/cheese deli. Supplementing the deli, are a few tables to sit down and enjoy some of the sandwiches freshly sliced from the deli counter (ranging from $180-$300 NT). But as a fine foods importer, the place is also packed ceiling high with rare imported good that you can't find anywhere else in Taipei. In addition, this foods market expands to the basement where some great imported pastas, beers and cereals are. Furthermore, there's a small modern and very professional kitchen tucked into the corner for the monthly culinary classes they hold. So tonight I enjoyed a great little half pastrami and half corned beef sandwich on a soft whole wheat bread. By the way, you can't order it half and half. I traded with my culinary partner panda girl. In addition, we tried some of their awesome baked mac 'n cheese. I totally forgot about mac 'n cheese! Oh how my taste buds thanked me for brings back some good old traditional flavors. I...I mean, we...promptly inhaled that. As a result, I decided to make a stop by Swensen's Grill and Ice Cream on the way home. This is another great american restaurant. It resembles a TGI Friday's or a Bennigan's, for those that know what I'm talking about. I just wanted an ice cream float ($219 NT). Another down home delicacy that I have forgotten about. They have about 12 flavors to choose from and it's served in a tall, classic, frosty mug. Delicious and very satisfying down to the last slurp! I didn't get a chance to try out their dishes, but it's definitely on my list of places I have to visit. Great american food and dessert and a great way to end the day.